When I realized I had the opportunity to collaborate with The Label Monster, I was so excited. The Label Monster seeks to curate the best brands for an urbanite, and I have always loved looking at the companies they choose to sell. They always choose unforgettable statements for your closet. The first brand that stood out to me, when purusing their website, was Frame Denim. I have been in love with Frame Denim since I first saw Mary Kate and Ashley Olsen wearing their jeans. Thankfully, you can wear denim all year around in most countries. Living in middle GA there may be fewer days with the humidity, but I'm sure that won't stop me from pairing these jeans with everything. You just can't go wrong with a solid black or white ripped denim pant. Whether it's spring, summer, fall or winter you can throw denim on with a pair of boots and layered sweaters or Nisolo sandals and an amazing striped tee! 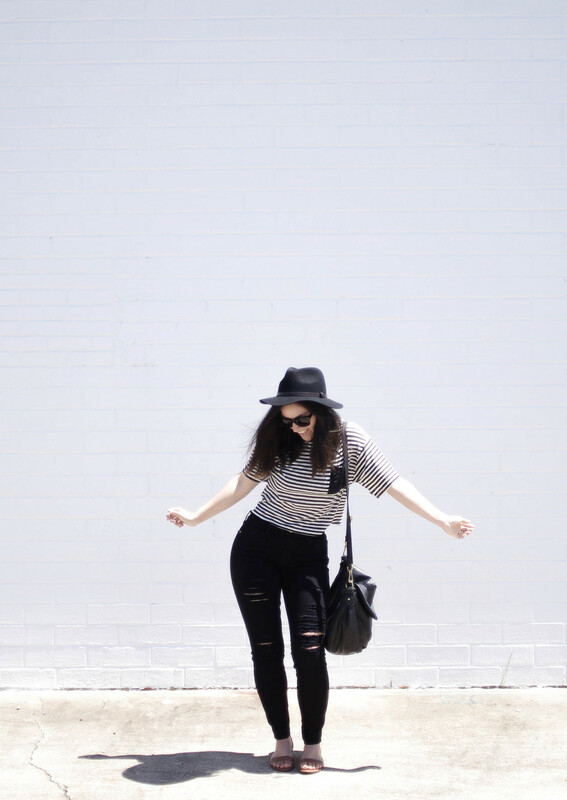 This striped tee from Shop Westlook is perfection. It is light and airy for summer, and also is cropped for a loose fit to let that summer breeze in! haha. On top of all the technical perfection, it is simply the best striped tee staple that you need in your closet! If you are looking for a quality made denim that will last you forever, and has the perfect stretch, I highly recommend grabbing a pair of these. Below is a short bio which explains the start up of this Swedish Denim Duo better than I could. No wonder they were a hit this past year at NYFW! Use MELODYTLM for 20% off the The Label Monster site! I hope everyone is having a lovely week thus far! Latest Web Design - Brooke Wood Makeup!